On Feb. 3, the world will tune in to watch the Los Angeles Rams take on the New England Patriots in Super Bowl LIII. And while we watch the game, we will eat. 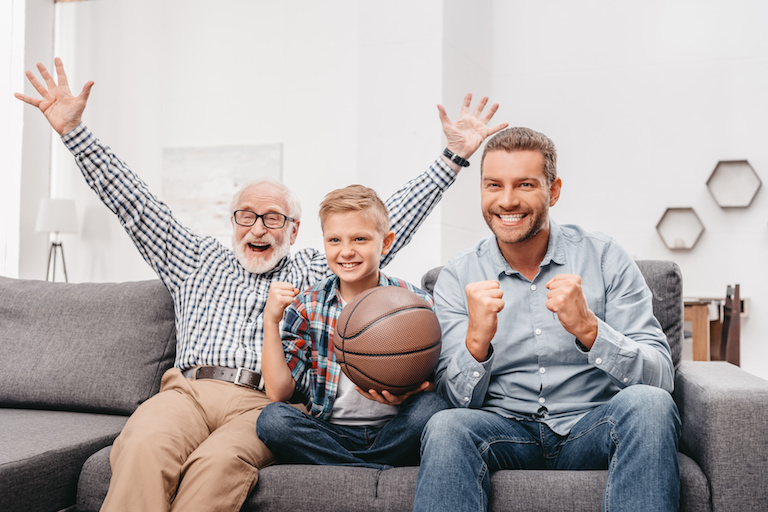 Super Bowl snacks have become synonymous with the game experience, but as we age, it is important for us to snack smart – even on Super Bowl Sunday. Nutritional needs change as we get older. Our appetites may wane, and our ability to chew and digest certain foods can be affected. Changing medical conditions may also alter what types of foods we can and cannot safely eat. However, snacking between meals can have benefits for seniors. Snacks that are high in vitamins, minerals and fiber can supplement our main meals, to make sure we are getting the calories and nutrients we need each day. Snacks also have social value. Snack time can be the perfect time to share food with friends and family or a great addition to social activities such as games, puzzles, bingo or watching a movie. The key to the game is to snack smart. Weight gain can occur when you snack out of habit, boredom, stress or frustration, instead of eating when you’re hungry. Even if you’re eating smart foods, frequent snacking paired with inactivity can result in excess weight gain, especially if you eat energy-dense snacks or your servings are large. Health repercussions are a danger with frequent snacking because many of the most common snack foods are high in refined carbohydrates or added sugar and low in nutritional value. Non-diet soft drinks, cookies, candy, pastries, chips, pretzels and crackers generally contain more calories and are less satisfying than fruits, vegetables, whole grains, nuts and seeds. Consuming too many refined or sugar-rich foods can cause high blood triglyceride levels while decreasing levels of health-promoting HDL cholesterol, according to the American Heart Association. These conditions are indicators for an increased risk of developing heart disease, especially when accompanied by excess weight. Tooth decay can be accelerated by frequent snacking. The more you eat, the more opportunities the bacteria in plaque have to produce enamel-damaging acids. This is particularly true with carbohydrate-rich foods, because the simple sugars that make up carbohydrates are what feed plaque bacteria. To promote oral health when snacking, eat the whole snack at one time instead of nibbling it intermittently. Rinse your mouth with water afterward to remove food particles, then brush and floss, if possible. Anxiety is often caused by over-snacking at any age, because we feel guilty. Over a period of time, this can lead to serious psychological problems or eating disorders. Cheese slices can be an important alternate source of dairy for a senior’s diet, offering much-need calcium. Most senior adult women need more calcium in their daily menu in order to ward off osteoporosis. Eat with wholegrain crackers to add extra valuable nutrients as well as fiber. Chocolate-covered raisins can take the place of candy for seniors with a sweet tooth. To lower the sugar content of the snack, mix the chocolate-covered raisins in a bowl with some dry cheerios, unsalted sunflower seeds and dry cranberries. Toss the mixture together and serve a pre-measured portion, such as 1/3 cup. Fresh fruit is a great hydrating snack. It offers much-need fluids and packs a punch with antioxidants and vitamins. Bananas, especially, provide the necessary potassium most senior adults are lacking in sufficient quantity. Fresh fruit and berries also serve as a great dessert substitute for those who are cannot eat sweets due to dietary restrictions. Hard-boiled eggs are inexpensive and one of the most nutritionally dense proteins you can eat. Keep hard-boiled eggs in the fridge for a quick and easy snack. At only 75 calories, they can be eaten alone or paired with a slice of wholegrain toast. Healthy nuts contain fats, protein, minerals and other nutrients that are a great addition to the diet of senior adults. Try out a few different varieties such as almonds, pistachios, Brazil nuts, hazelnuts and cashews. Beware: some of the harder nuts may be difficult to chew if you wear dentures. Popcorn is inexpensive, and it’s easy to eat and chew. It can be seasoned in countless ways to make it sweet or savory – including the addition of cinnamon, salt substitutes or dried herbs. Precut veggies can be prepared ahead of time and eaten alone or with a tasty dip. Store a mixed bag of carrots, broccoli, cauliflower pieces and snap peas in your fridge and add cherry tomatoes and cucumber slices at serving time. Use fresh herbs such as dill or scallions to flavor the dip. Yogurt mixed with granola can also be made ahead of time and stored in the fridge. Give the granola some time to soak up the yogurt and soften. Stir in fruit for added nutrients and flavor. Eating healthy snacks doesn’t mean you can eat as much as you want, whenever you want. According to NOAH Net Wellness, a University of Georgia site about nutrition for older adults, timing your snacks properly throughout the day is crucial. For instance, if you’re hungry but don’t intend to eat for about an hour, choose a 100- to 200-calorie snack, such as a handful of popcorn or a medium piece of fruit. If you won’t be eating for a few hours, choose a snack of about 200 to 250 calories, such as a sliced apple with peanut butter or a small whole-grain muffin with a cup of low-fat milk. Keep healthy snacks on hand at all times, so you don’t turn to less healthy options when you become hungry throughout the day. To make snacks a healthy part of your diet on Super Bowl Sunday and throughout the year, consider your energy needs and meal times and snack accordingly. Reserve sugary treats for special occasions and avoid foods that provide nothing but empty calories. Such foods have little nutritional value and are generally not filling. Instead, select whole foods that are nutrient-rich, provide some amount of fiber and are relatively low in calories. By making smart snack choices, you can stay on top of your game and improve your overall health. And a healthy you makes you a winner every time!